Click the image above to obtain a larger version (approx. 5.4 MB). 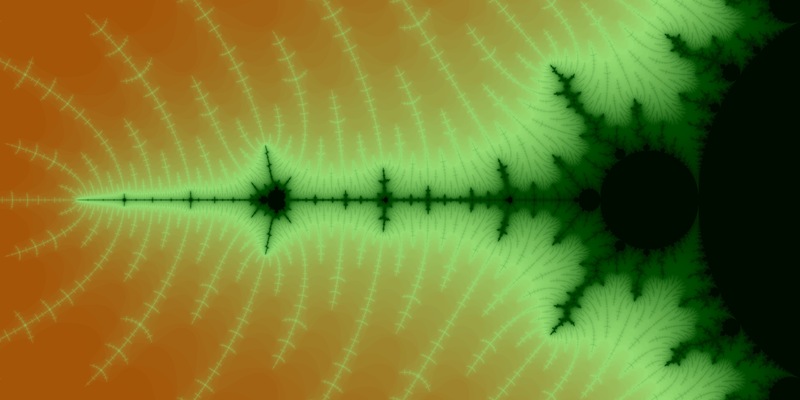 This image is centered on a region of the Mandelbrot set to the west of the origin (the center of the image is at about \((-1.55545, 0)\)). This region, near the edge of the main cardioid, is characterized by long, spindly forms and miniature copies of the set as a whole. I initially created an image of this region with black and white bands, in an effort to get a better feeling for how my algorithm was coloring certain areas. When I looked at the image, it reminded me of the alluvial fans created by drainages running off of the mountains and into the valleys of the Great Basin. With some careful adjustments to the color palette, I was able to create an image that, I hope, conveys that experience. The colors are meant to evoke the alkali dirt, sage brush, and piñon trees common to the area.